You know, I’m enjoying my life this summer. John Daly’s have been abundant (that’s a spiked Arnold Palmer, by the way). I’ve been to the beach regularly. I have not gotten a SINGLE sunburn all season (Mom, how proud are you of me??). I should note that this is a significant fact considering that most of the year I am roughly the color of…translucent. Here Comes Honey Boo Boo premieres next week. I cannot even begin to express how excited I am. And I’ve been eating well. And sometimes (partially) for free. When I stopped by my parents’ house last week, they insisted that I take a few mini eggplants home with me. Free eggplants shall not be squandered. Though, I sometimes find the task of assigning them a purpose a bit difficult. So, whilst watching some Olympians dive syncronizedly into pools, I roasted them on my gas burner. It was surprisingly therapeutic. Which was weird. Oh, and then I roasted some garlic. That was therapeutic, too. And then I made pizza! Kind of. 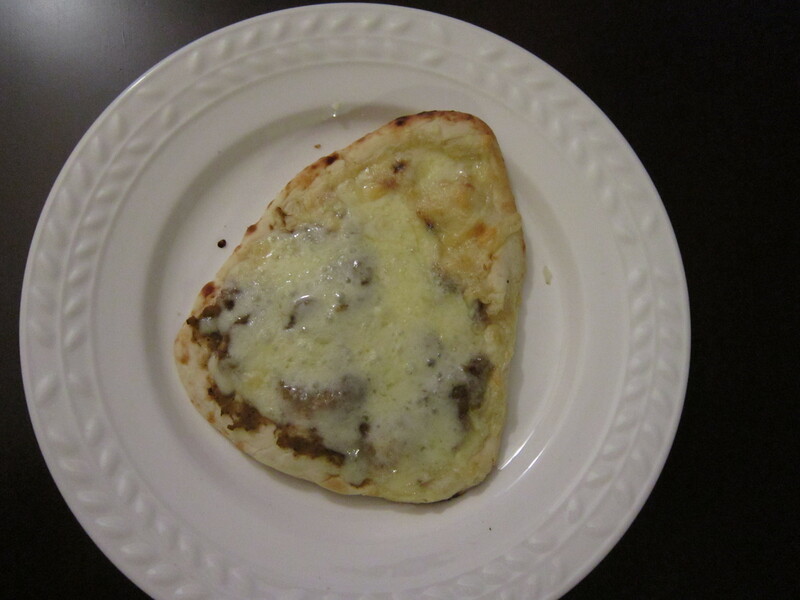 I topped some naan with some other stuff and stuck it in my toaster oven. Because making dough from scratch and pre-heating my actual oven doesn’t actively make me jump for joy. 2. 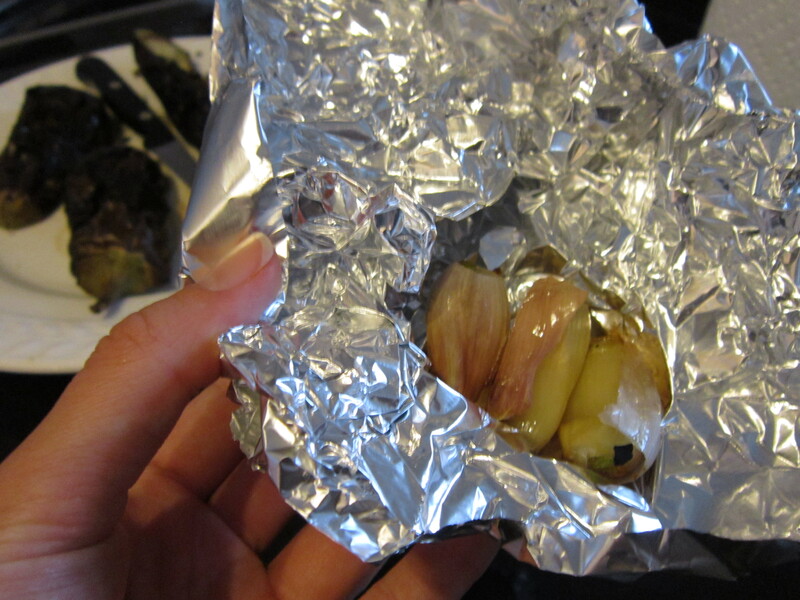 Cut off the top of the garlic cloves (leaving the rest of the peel in tact), drizzle with oil and wrap in aluminum foil. Place in oven and roast for 25-30 minutes until soft. 3. Rinse and dry eggplants. Place on a gas range or grill over medium heat (alternatively, pierce holes in the skin and roast with the garlic), rotating frequently until charred on all sides and very soft, about 20-25 minutes. 4. Allow eggplant to cool, scrape the flesh away from the skin and combine with garlic cloves (which should slip out of their peels easily) in a food processor. Pulse until it reaches your desired consistency. 5. 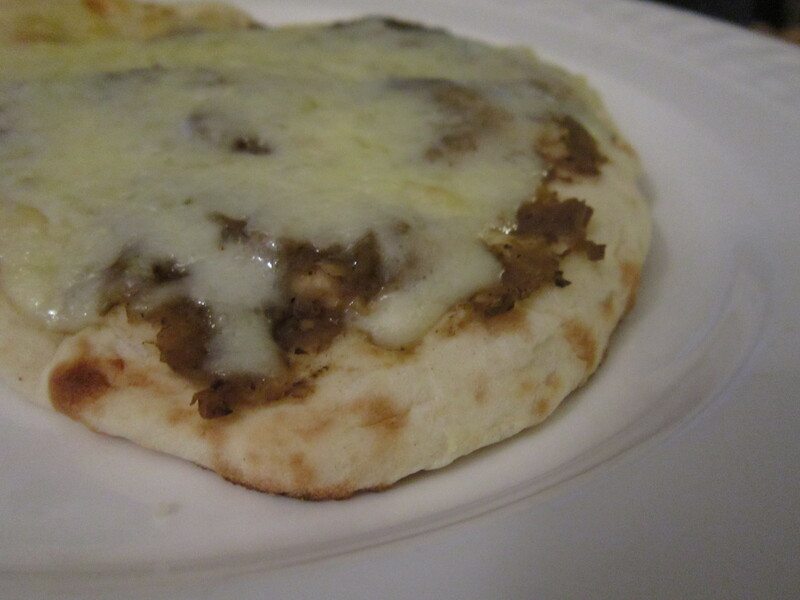 Top naan with eggplant, then cheese and bake for 5-10 minutes until cheese is bubbly and beginning to brown. 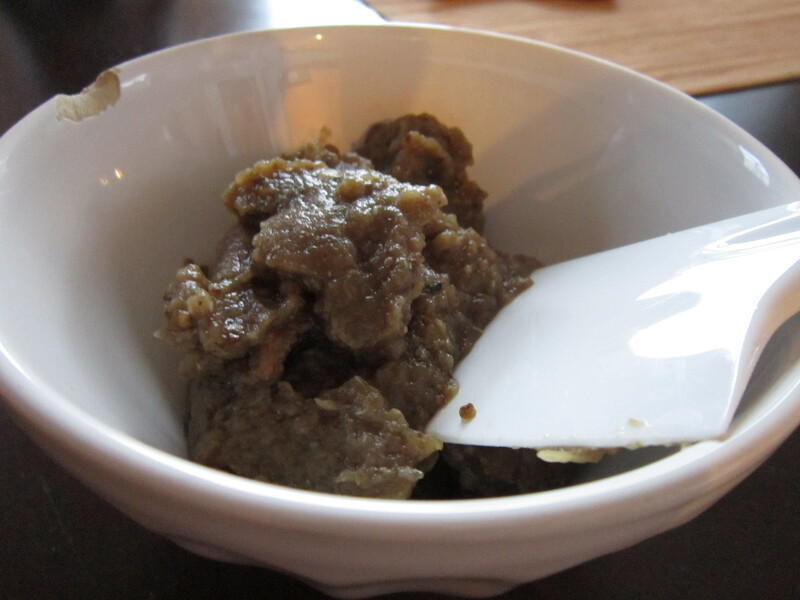 The eggplant/garlic mixture is reminiscent of baba ghanoush, without the tahini. And without quite as much effort. Because this is simple summer living and I can’t be bothered. I’ll work with what I’ve got, thankyouverymuch. Even if I do cheat on the crust. Making your own pizza dough is overrated anyway. Trader Joe’s is way more cost/time efficient. And that’s the real win. I agree. Food in my mouth faster = wins every time. I don’t think I’ve ever successfully cooked eggplant. Bummer. But this makes me want to try again. Honey boo boo scared me. I love her. I am so freaking excited. 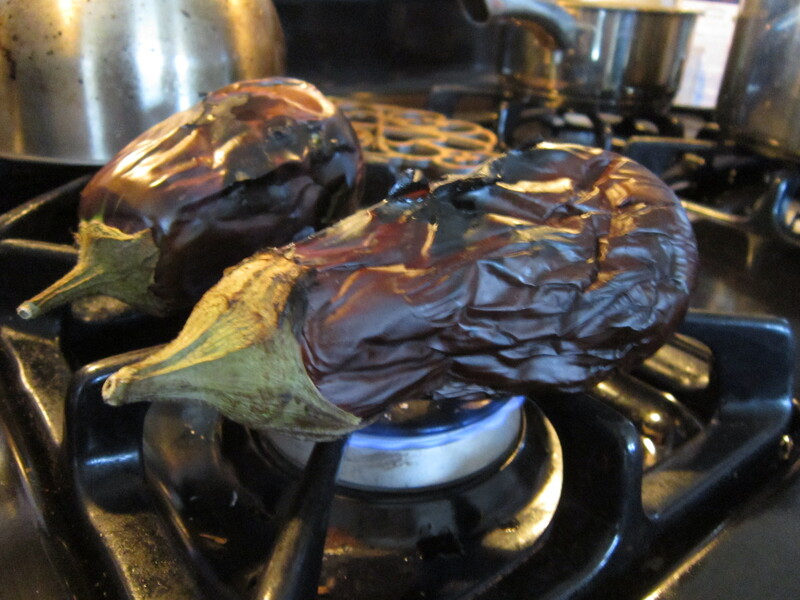 Cooking eggplant isn’t too bad- you should definitely give it another try! Finally, a vegetable we can agree on! My love for eggplant runs deep. As does my love for pizza. And Honey Boo Boo? Oh, lord I simply cannot wait. I’m so excited for our redneck margarita and bacon infused viewing party. I can’t talk about it or I’ll get all hyper and excited again. This is probably the only way I’d eat an eggplant. Great idea! Sooo I would so burn down the house trying to roast eggplant on TOP of my stove. But serious kudos for effectively NOT. I am also a big fan of naan pizza. Great job! That eggplant-garlic mixture looks heavenly! Sounds like a good way to avoid eggplant’s sometimes-weird texture. Also, holler at parents having bountiful veggie gardens! I have been swimming in zucchini for weeks now! Haha, my parents totally don’t have a vegetable garden- I’m pretty sure these came from Costco! 🙂 I wish they had a veggie garden! Haha… oops. Well, sounds like they have bountiful veggies nonetheless. I’ve never known what to do with eggplant. I buy it with such good intentions, and then wind up making something disgusting. And this whole Honey Boo Boo thing freaks me out a little. I can’t help but wonder what is going to happen to this child when she grows up. I know- that happens to me with eggplant, too. Honey Boo Boo Child is going to be an interesting adult, I’ll say that much. I can’t WAIT. I have never tried roasting something directly on the stove – I’m always afraid I’m going to set our apartment on fire. It looks so cool though! Is there a certain technique? Nope, just keep the flame at medium/medium-low and babysit it. It just chars like a bell pepper would! You can cook eggplant on the stove like that? Impressive! And what better reason to visit your parents than to bring back some tasty leftovers / extras? I do it all the time. Yep, it’s really easy! Just requires a litte patience. Happy Wednesday to you! I love you for introducing me to naan pizza a la Trader Joe’s garlic naan, however, having said that, you owe me new pants bc I think I’ve gained at least 10lbs as a byproduct of this realization.